Kind of. See if you recognize the subway station between 1:19 and 2:07. Yeah. That’s Beacon Hill – too obvious!!!!! Also curious as to how this new electronic Africa will be powered. Johannesburg and other cities are struggling to keep their existing electric grid up. Not to say there won’t be advances in power generation, but can’t a bright child learn arithmetic with a pencil? I’m kind of looking forward to the sequel when right in the middle of a multiquadtrillion Rand meeting, Jo’berg’s power blows out bigtime, and all these brilliant cute young people have to figure work out basic life with no screens. Bet the little girl and the Assistant Bellhop’s kids could still show them arithmetic anyhow. Unreliable electric power happens in a lot of developing countries. Some places are doing a better job than others to try to address the problem. In any case if power cuts are common the more well to do (and their offices and stores) will have generators. While South Africa faces a lot of challenges it by far has the best infrastructure of any sub-Saharan African country. Ya, I have to say I was a bit bothered by the “optics” in this film but didn’t want to raise the issue. Thanks for doing that. I, for one, look forward to Hong Kong’s impending expansion into Beacon Hill. Maybe then we can get some real rapid transit up in this place! And to think, ST wanted the tunnel and Beacon Hill to be single-track! Oh, and who installs that smaller pump? Manufactures it? Boxes it, ships it? And who is out growing the food these people eat? Somehow this doesn’t look like the future we all get to live. I’m preparing for The Collapse by switching to my $79 e.Ink Kindle. One week of battery life and probably could be solar charged in 30 minutes. I use the experimental broswer plus wifi as my energy sipping MID. Actually, on second viewing I think the software module running on the card in his hand is supposed to be the “Bellhop Assistant”, not the guy holding the card. It’s right in line with the old-school “Office Assistant” (remember the talking paper clip?) that was so reviled when it was introduced a couple of Office versions ago. Amtrak announces Cascades Thanksgiving special schedule. Includes the midnight express to Portland like last year. I don’t think I get the point of the midnight express. Are folks actually expected to ride it? They’ll be too sleepy to baste the bird! The trip from Seattle to Portland is a positioning move. They’re selling tickets on what would otherwise be a deadhead. And it takes 45 minutes LONGER in the middle of the night without stopping anywhere than during the say with all stops. Interesting. Um, looks like a 4h 15m trip to me, just like most of the others. I presume these runs are using AmFleet/Horizon cars so they cannot go as fast as the Talgos can. If we’re all supposed to be telecommuting, what will we do with our parking garages? Turn them into server farms, of course. A 6-story parking garage downtown is being converted into a server farm. Excellent. I suspect the energy consumption of the servers in an average parking spot may outstrip the cars that would be parked there but at least a large percentage of that energy is renewable. If they leave some parking spaces for electric/hydrogen cars, they can draw energy from the cars and pay the drivers. Not that I’m in favor of encouraging SOVs to park downtown, but it may have a limited role. With a hotel right next door it’s likely they can recover the heat created by the server farm. If they do this, it may be less polluting than the cars it replaces. [Mike] I’m not sold on the *pull elecricity from electric cars when needed* concept. The most expensive thing about an electric car is the battery, and batteries have a limited number of cycles – making this a very, very expensive form of energy. He also mentioned FCEVs and in that case using them as power sources would be a locally pollution free use with no drawbacks. I Don’t think the issue is so much that the garage is underutilized as it is more valuable as datacenter space than as garage space. Note that part of the Securities building garage was turned into Bed, Bath, & Beyond a while back. Another section was converted to datacenter space around the same time. How does Metro decide what routes get which numbers? Trying to figure out how likely it is the 14N will get renamed the 6. I don’t think I’ve seen them reintroduce a route number that has been retired (the 6 Express used to go up Aurora with a local version that swung through parts of Wallingford and Green Lake). Outside of the general two-digit city routes, 100 series serving South King, 200 series serving the Eastside, and 300 series serving North King I don’t know if there’s a specific route naming convention. It’s not about confusion it’s about respect for Mark McLaughlin. Wasn’t that on the 359, not the 6? Yes – that was the 359 that went off the bridge, not the 6. Morgan: Yes, but the 6 went away at the same time as the 359, so I’m speculating that Metro may be hesitant to reuse the number 6 for that reason. I could be completely wrong. Seems to me one of the new routes in September, 2012 is named the 32; another the 40, another the 50. Those were all previously used. I thought 6 went away before 359? I was thinking the same thing — it seems awfully strange to have two routes numbered 14 that are not connected in any way. What I know for sure is that Metro never reuses a number that has been retired recently, simply because it would be too confusing. You have to wait at least a few years. Also, I doubt that Metro would reuse the number 6, simply because of its association with the former 359. But I could be wrong on that one. If I had to guess, I’d say the 14S would be renumbered the 1S. One route with two numbers is common. Two completely unrelated routes with one number is unheard of. The closest example is the 5, but both routings of the 5 share a large common segment; in this case, the two 14s would have nothing in common. The N/S designations are internal-only. Internally, the 3N goes from downtown to Queen Anne, and the 3S goes from downtown to Madrona; externally, they’re all just the three. If the south part of the 14 is connected with the 1, then renumbering the south part to also be the 1 would make some amount of sense. In contrast, how confusing would it be to take the 14, then find out that your bus suddenly became the 1 and you need to switch to another bus to get back on the 14? My guess? 20 or 47. Morgan: The Oct 2012 document we’re all talking about does, in fact, say that the 1 and 14S will be rerouted. Metro has reused numbers after several years. A few years ago a two-digit number was given to a route that had been used for a completely different route in the 80s and early 90s, but I don’t remember which one now. The 226 and 235 numbers were restored to their traditional (1980s) routes in the RapidRide B reorganization. They aren’t following the exact old routes, but the 235 is the main route for Bellevue-Kirkland-Totem Lake (alongside 234 for Bellevue-Kirkland). Previously the 235 was Seattle-Mercer Island-Bellevue-Kirkland(-Totem Lake). The 226 is now a milk run to Northup Way east of Crossroads. Earlier it was Seattle-Mercer Island-Bellevue-NE 8th-Northup Way-Overlake(-Redmond). I was expecting the 7-north to be numbered 6 rather than 49, but it didn’t happen. That reminds me. I think it was the 30 that went from Wallingford to Laurelhurst on 45th. It duplicated the 43 (now 44) between Wallingford and 15th. The 30 still runs from Seattle Center to Sand Point via Fremont, Wallingford, and the U District (on 40th through Wallingford and then on 50th and 55th through the U District). They’re proposing to do away with it in 9/12. By the way the eastern part of the 30 is proposed to be incorporated into the new 63 and the western portion (with a shift to 15th W and the Western side of Seattle Center instead of Westlake and the Eastern Side of Seattle Center) will be part of the proposed 32. Yes but the 30 was gone for several years, and when it came back it was a different route, one that doesn’t go to either Wallingford or Laurelhurst. The 30 currently serves Wallingford. It goes through the neighborhood on N/NE 40th then turns south on Stone and then west on 35th through Fremont. when did the 6 last operate? 2. When East Link is finished … I would imagine that it will have its own dedicated fleet of LRVs (unless ST will replace the printed route maps with digital ones that can switch routing info) … but I wonder if they will visually indicate the difference on the outside of the cars (we don’t want tourists wanting the airport to get on the wrong train) … I don’t think the reader board on the front/sides will be enough especially if the train is moving quickly into the stations. They’ll almost certainly not want to turn around trains at CPS, as the highest ridership segment on the system will be International District-Northgate. I’ll be interested to see how they differentiate the routes too. Sometimes it’s worthwhile to turn trains around just for peak capacity issues. Otherwise, you can get into a situation where trains are full even before they get to Westlake, and anyone transferring to Link there will have to stand for the whole ride. Boston does this with the Green Line. You’ll be riding the train, expecting to go to Government Center or North Station, and suddenly you’ll hear “this train is going out of service at Park Street”. They kick everyone off, and it circles back around to the outbound platform. That way, people transferring from the Red or Orange Lines have a chance at getting a seat. But if you have more trains going the whole way, everyone has a higher likelihood of getting a seat. And anyways, people shouldn’t expect to get a seat very often if U Link and North Link are as popular as expected. Alex: I misspoke when I said “seat”. In Boston, trains often don’t even have standing room available. Turning trains around at Park Street is the only way that Red Line transfer passengers can get on a Green Line train at all. The point is that sometimes you want to provide extra capacity at one station, even it comes at the expense of capacity at a different station. It’s about fairness and starvation-freedom (in the technical sense). If 100% of trains are packed full by the time they get to Westlake, then the train is useless to anyone who’s transferring from a bus at Westlake. If 80% of trains are packed full and the other 20% are empty, then people from North Link have to wait a bit longer, but now the available capacity at Westlake is greater than zero. I believe there were some elevation or turning radius issues which precluded the use of Convention Place station. In New York and Boston, you figure out if you’re on the right train by watching the front/sides and listening to the audio announcement. I think that would be sufficient for Seattle too. The automated announcment system on LINK can (and did before revenue started) make announcements as the doors open at every station. The information signs (interior for certain – exterior maybe)can display multiple colors. Add that to the dynamic station signs displaying the destination of approaching trains and I think we will be able to determine which train to get on. The elevation precluded going from Convention Place to Capitol Hill or First Hill. Making Convention Place a stub track was never brought up that I heard of. I can see “Overlake via Bellevue” and “S. 200th via SeaTac” or something like that. Aleks mentioned the Boston example – I’m from there and you can have multiple destinations on both the Red and Green lines and people seem to navigate it ok. I also bet the PA systems in Seattle will be much better than the mumbles you get on the T in Boston. The MBTA reminds me that, whatever people say they want in a transit system, what they really want are high-capacity, high-frequency trunk lines. Bitching about the T (the delays, the garbled announcements, pretty much everything about the Green Line) is pretty much Boston’s official pastime, and yet the Green and Red Lines have more daily ridership than all of Metro’s bus routes combined. Actually bitching about the Red Sox is Boston’s official pastime but bitching about the T is a pretty close second. I would agree that people want high-capacity, high-frequency lines. I think the challenge we’re facing in this area is that the transit agencies are trying to shift to a transfer centered system before the replacement service is either high-capacity or high-frequency for a lot of folks. Yes, I agree. I’m starting to think that the most important message we can send Metro is that [a] high-frequency means 10 minute headways all day, and [b] the most important network routes need to be 10 minutes, even if Metro doesn’t think the demand exists. That means 10-minute headways on all in-city RapidRides, as well as major non-RapidRide routes (e.g. the 48, the 3, and at least one route that goes to Capitol Hill). Bitching about the transportation system seems to be the official pasttime in practically every city in the world. People in New York claim to hate the MTA and everything it stands for, but still take the subway multiple times a day. In Paris you have the number and the end station. That works really well and I can’t imagine why we need to make it more complex. I’m constantly amazed at how complex people can make a simple thing. The train comes from somewhere and it going somewhere else with stops in between. The wall signs tell you everything you need to know. They show a vertical list of stops and the train is always going down. Somewhere in the middle is a highlighted station showing where you are. You can be walking at full speed, glance at the sign and know which tunnel to enter. They also show transfer lines and at which stations. In the sign above I can be walking down the tunnel and if I know that I need the number 8 to get to my apartment I don’t even have to care WHICH train I’m getting on or where it goes. I just glance at the sign, see that there’s a transfer to the number 8 below the highlighted station and I board the train. At the Opera Station I get off and grab the number 8. 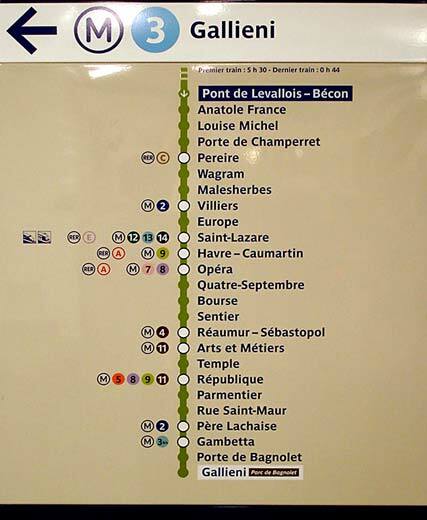 I don’t have to remember end stations either because when I go to the Number 8 tunnel I just look at the two signs there and find the one with my stop BELOW the highlighted station. It works REALLY well. I was very depressed to learn that the Monorail WASN’T a full fledged rapid transit line. When I got on the bus to Seattle I asked the driver which was the first stop at a Monorail station. To those outside the area that is how it is portrayed in movies, on TV, etc. And of course movie continuity can often be hilarious to the locals of the city it was filmed in such as “Sleepless in Seattle” where the protagonists launch a kayak in Lake Union and next scene they land on Alki beach! That would actually be a fun trip. The locks would certainly be exciting. They could probably portage their Kayak around the locks I suppose if they didn’t want to wait in a line of boats to get through. It’s the exchange rate and tax credits. Don’t forget “House of Games” 1987 which showed the airport subway as our ‘Metro’. Yours truly in a cameo – perhaps mistakenly – appeared in a distant shot operating a MAN 40′ on third avenue very early one morning where Benaroya now stands. Also I think it was “Disclosure” 1994 that starred Pioneer Square Station with a Breda pulling up headed for somewhere tunnel busses never went. And remember the Demi Moore Michael Douglas movie that proved that if you wanted to take the ferry, you could ride the Route 302 to Pioneer Square tunnel Station? But I think my favorite has always been the “Nightstalker” episode where Darin McGavin had to track down the mad Union Army doctor who had been hiding in the Seattle Underground for a hundred years, waking up every decade for another injection of blood. Real ongoing danger here: if this guy wakes up now and accidentally nails one or two habitual initiative-sponsors, the horror could go on forever. Most movies in Seattle are filmed in Vancouver because it’s cheaper to film there. Lucky 7 showed a Ferry to Orcas Island but it wasn’t a WA state ferry nor was it Orcas Island. it is still happening; the Killing, AMC, set in Seattle, filmed in Vancouver; they took a Translike bus to the teacher’s house. At IDS staging, I notice northbound tracks already in the pavement along the east wall, though presently with large number of non-revenue vehicles parked on top of them. Very likely these tracks will bring EastLINK into IDS without major disruption. Also possible that inbound service from I90 could run much better if another parking lot could be found for those vehicles right now, freeing up lane space for revenue service. Anybody know the actual facts on these parked-on tracks? I think those were left overs from the original unusable tracks they put in the tunnel, kind of like the tracks in CPS. It probably won’t be entirely out of commission. Expect lots of turnbacks at Stadium or Beacon Hill. Portland’s Steel Bridge was closed to trains, buses and cars for 22 days to connect the Portland Mall tracks to the existing tracks on the westside of the river. Meanwhile, San Francisco Muni rebuilt a track intersection in about 3 days (no overhead work). Are there any plans to build a center platform? Otherwise the transfer to get from Bellevue to the Airport will be really annoying. Stadium Station has a central platform. That won’t help. Stadium is south of where East Link will join with Central Link. I was thinking about that and they’d have to build all new stairs/elevators to accomodate that. Would be nice though. I think the only practical stations for a center platform addition would be IDS and Westlake. Both have mezzanines above the tracks. PST and UST I don’t know if there is enough clearance for the elevator towers AND stairs/escalators at the separate end mezzanines at those stops. I still don’t agree that elevators and escalators for a new center platfrom at IDS are needed, given that the center platform’s only purpose would be transferring between East Link and South Link, and there are plenty of ways to keep a passenger from getting stranded. I certainly have no problem with adding the extra elevators. I suppose those extra elevators could come in handy to avoid a mess like we had at Mount Baker Station a couple months back: having wheelchair riders get off at a different station and then backtrack. But I do assert that the center platform *is* a necessary feature before the second track opens for service, as failure to add it will add a few more precious minutes to trip time, and adding the center platform should be really easy. Probably quicker to jump off E Link at Rainier, catch a SB 7 to McCleallan and jump on the first SB Link, rather than doing all the back tracking into Seattle. Passengers with baggage would probably prefer wheeling their baggage off one train and right onto another rather than wheeling their baggage down a long ramp, waiting for a bus, and then carting their baggage up an escalator. Besides, who wants to take a 3-seat ride to the airport? Or even a two seat ride. OK, Let’s race. I’ll jump on the 560 and be at Seatac Arpt in 50 minutes. You can take E.Link to IDS (21 min), up and over the mezzanine and wait an avg of 5 min for a train, then travel to Seatac (32 min), for a total trip time of 58. I’ll take the one seat ride and beat you by 8 minutes. You’ll take Link because 405 will hopelessly congested by then and the 560 probably won’t compete with Link anyway. A direct transfer between the lines should be an obvious requirement. Otherwise it significantly damages the system’s effectiveness. Given that most people will be transferring from northbound SODO to eastbound East Link and vice-versa, there should be some mitigation for the fact that the trains are going in opposite directions. Walking up to the mezzanine and back down is a minimum requirement — not taking a bus between trains! — but they really should reorganize Intl Dist to center platform. That would also give an opportunity to prepare a stub transfer entrance to a future 2nd Avenue or 5th Avenue tunnel. It seems like they could stage the trackwork to limit the length of outages. It seems like they could build the WB East Link track up to the turnout where it joins the current alignment of NB Central Link including the turnout where NB could join WB. They could build the EB East Link track up to the turnout where it diverges from SB Central Link. They could then cut in the switches during relatively short work windows (a weekend? three weekends?). Then use the same procedures to get the new OCS done, or simply do it during the other closures. Maybe they could do it all during the late night closures, but that wouldn’t give a lot of time. For the existing tracks, they need to worry about embedded tracks, but would that be the case for the new construction? By that time, they shouldn’t need to worry about buses in the tunnel. Hello. I was going to debut this at the next meetup, but since Metro’s unveiling a new service change I think it’s time to debut it now. Here are some “fantasy” Metro routes I designed–essentially the South Seattle equivalent of the 70-series routes to the U-District. All maps were created with Inkscape. Stop lists and timetables will be produced shortly. What do you think? Thanks for the effort, SR. I’m afraid the South Park Bridge will be back up before Metro could even consider such a restructuring. As it is, the extra mitigatory service on the 132 that the county should have given South Park last summer isn’t happening until 2-8 months before the bridge re-opens, and then ridership on the 132 will drop again. Arrrgh. I don’t wish to make all riders going to Tukwila or Renton have to pass through South Park. What did they do to deserve that? Frankly, I’d be happy with just two routes going through South Park: the 60, with no VA loop and reaching our schools (Sealth and Denny Middle), and the 30-minute 132, so long as it reaches TIBS without scoliating all over Tukwila. I’d be quite happy to transfer to the F Line to get to Burien, Southcenter, or Renton, so long as I don’t have to start from out-of-the-way Burien. If you want a trunk-and-tails system similar to the U-District, think of the various permutations on restructuring routes around Rainier Beach Station. Burien TC, BTW, has way more options for getting downtown quickly than you can shake a stick at. Peak hour, it has two-way 121/122/123. Off-peak, it has the frequent and mostly-straight 120, for those who want a 1-seat ride. Plus, it has the 140 to TIBS, which is actually a few minutes faster average wait+travel time to downtown than the 120, FWIW. Nobody in their right mind rides the 132 all the way from Burien TC to downtown, or vice versa. South Park shouldn’t be the south-end equivalent of the U District to the 70-series routes, Rainier Beach should. Again, these are just works in progress. They are merely clones of the 70-series in many ways. The entire corridor provided service that otherwise sees 60-minute headways in non-peak times, and would (after route 132 moves to 4th) provide service on 1st Ave S south of Spokane St that would otherwise be curtailed. Route 103’s tail provided a more direct route between Tukwila P&R and Kent Station than Route 150, which takes a side-trip through Southcenter. Route 104’s tail East of RTC provided 7-day a week services to the communities around Renton Highlands, Ron Regis Park and SR-169 which otherwise see service only on weekdays. Just to be clear, I am not suggesting a whole fleet of interlined buses to Henderson Station. I am suggesting taking advantage of the train connection. I previously proposed interlining various routes that terminate at Renton TC or Renton P&R to instead continue up Sunset Way and MLK to Henderson Station. This treats Renton as a southern equivalent of the U District, sort of, rather than as merely a couple park & rides. Peak 101 riders will hate the idea, as it will actually lengthen their commute time a few minutes. But those with a forced transfer to the 101 will benefit, including by being able to grab seats before the parkers do. Southcenter is, likewise, a candidate for being treated like the U-District, but that would require a whole lot of new service hours. If you take Southcenter out of the 150, I’m afraid its ridership would plummet. Then frequency would be reduced. Then ridership would plummet more, in a vicious cycle. Like Brent says, I think it’s more interesting to focus on transfers to the already-frequent trunk line (Link). on Madison … traffic was backed up from 12th Ave all the way to the hill down to I5 (at least to 9th Ave) … and the 12 and the 60 were stuck trying to get back into the traffic lanes from the bus stops. The main, visible, reason for this and something that should be done to improve the flow of traffic in general (on Madison) … would be to remove the parking spaces. There is no reason why there should be parking allowed at all on Madison between (at least) 9th Ave and Broadway. for EB traffic trying to turn left onto Boren … there is a 4 car long turn lane … but otherwise only one lane of traffic (thanks to cars parked on the curb lane.) … remove the parking and the buses could get through the traffic faster and cars trying to continue on Madison wouldn’t get stuck behind traffic trying to turn onto Boren. the Cost? only new no parking ANY TIME signs. Urban planners need to create the King Street Central Complex and have King Street Station widened by a few platforms (and add a few tracks further away to allow freight trains to pass by further away from the main terminal. There needs to be some pedestrian tunnels that connect King Street Station to Intl. Distric Station and the future First Hill Streetcar’s King Street Station one block north. This would create a triangular system of pedestrian tunnels and turn that area as a centerpeice for public transportation attracting business and completely remodeling that area eventually. Tunnels that keep people underground except when they emerge at stations do not attract business. Really? Montreal has a large mall complex linking their underground stations. Nothing like -40C plus wind chill to encourage tunnel use. People like walking in malls. They don’t like walking in empty tunnels. If they’re going to do tunnels it must have retail like the many underground malls in Asia. People don’t feel safe walking in enclosed dead spaces for long distances. However, it would be a massively expensive project that probably won’t pencil out financially. I think it’s better to improve the streetscape before trying to go underground, out of sight. Something that gracefully bridges the International District to Pioneer Square in a safe and welcoming way would do wonders towards making the area less scary. The best way to make the area less scary and bring in more business (not that there is a dearth right now), would be to increase the resident population. That takes getting pro-density people to move in and take over control of the neighborhood association, so we can get some upzones and TOD. +1 to underground malls. I haven’t been to Asia, but Montreal’s Underground City is amazing. Easy transfer between modes of transit in Seattle? Never! We actually detest easy transfers. It takes longer to transfer between the monorail and the Link than the trip between Seattle Center and Pioneer Square actually takes. Transferring between the SLU and anything else will take just as long. It takes me 10 minutes to go from the Amtrak Cascades track to the Sounder track 10 ft away. Let’s face it, we’ve never even seen efficient transit connections, how do you expect us to build it? One tunnel from Amtrak, to Sounder to Link would make MANY transfers doable that currently aren’t. It would also cut my commute home from Portland by 30 minutes. We take this to the point of insanity. I’m not disagreeing with you in general but are we really seeing a lot of folks wanting to transfer from the monorail to Link? Maybe if we integrated the monorail into the transit system. If I lived in Lower Queen Anne, the monorail would be a good choice compared to the travel time for buses – especially in rush hour. Was it the lack of a grade-separated system to get to Husky Stadium quickly, or just the lack of transit lanes? Brent, see this and this for what it looks like after a Husky game. I’m still amazed that Metro manages to get everyone out of the area in about 45 minutes. Took buses through the tunnel this weekend many times and loved the new on-board annoucements and reader board of next stations on most of the buses. It’s about time, but good job nonetheless. Felt like I was on a nice metro system. The more I think about the proposal to re-route the 124 to serve the Georgetown saloon district, Airport Way, and the meth clinic, the less I like the idea. The 124 is the main connection to major employment sites up and down the Duwamish Valley. Having it not serve SODO Station would ruin the opportunity for some beautiful east-west connectivity. I’d suggest re-routing the 106 to serve the northern stretch of Airport Way S, and being firm with the Georgetown business lobby (which is more interested in making riders take a detour through Georgetown than in getting somewhere on the bus) that the 106 provides ample frequency between east Georgetown and downtown, while the 124 does likewise for west Georgetown. Georgetown already has excellent east-west connectivity via the 60. Leaving the 124 right where it is, and letting the 106 take care of Airport Way, would be a net savings in bus hours. The one area losing service would be well within the walkshed of Airport Way and 4th Ave S.
Speaking of Georgetown connectivity, I think the southern tail of the proposed route 50 should be extended to Georgetown to create connectivity with routes like the 40? going Duwamish area jobs and to south West Seattle and White Center. This would be a better solution than requiring people to go north to SODO to transit west. People often cite the ADA as a reason why there would need to be elevators to a central platform at IDS and Westlake. Where in the ADA does it say that those with disabilities are required to have the same exact access as those that don’t? There are many instances where a disabled person is required to use a different entrance or travel a farther distance than an able-bodied person to enter an establishment and these entrances are all ADA-compliant. A transfer could be made the same way as it is now: Up the elevator on one side, down the elevator on the other. No access is lost, no discrimination is occurring, no law being broken. As to being marooned on the center platform after the last train has departed, well, lack of forward thinking certainly isn’t a covered disability. The question isn’t one of “equal” access, but of emergency access, and it isn’t just for ADA-covered passengers, but for all passengers. How do we keep passengers from being stranded on the central platform at IDS? What is the backup plan if the trains can’t move? Emergency stairs will do for most passengers, but for those in wheelchairs, there has to be an emergency escape plan. Which begs the question, what is the emergency escape plan at any station when the power goes out? In case of a fire or earthquake, the elevators go out of service anyway. Then people walk to the ends of the platforms and around the trains? Push comes to shove, someone (the driver?) is going to help that disabled person up the stairs or even out the end of the tunnel, for that matter. Sorry, I just don’t see the reason that an elevator is necessary or required by law for a center platform. I love how I could tell it was a Microsoft commercial just by which font they were using. And I find it laughable that they’re trying to pass off Beacon Hill as an MTR station. Toyota’s zero-emissions hydrogen car will apparently be sold to customers in four years’ time but in limited numbers. Not surprisingly the research and development on hydrogen power doesn’t come cheap and these cars will come with a high price tag. Here’s something I hadn’t previously heard about WRT the FHSC, Seattle tramway to be electrified in only one direction. I guess since the trip from First Hill to the terminal is downhill, regenerative braking could be used to recharge the battery.